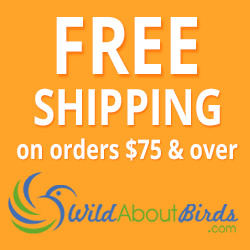 What can you expect if you put up purple martin houses on your property? You will be treated to an up-close view of the largest swallow in the United States. Purple martins eat only insects, and often hunt for food much higher up than other swallows. They are hard to see up close without your own purple martin bird box. Experiencing purple martins is about more than just getting a good look at these beautiful birds. Purple martins are a loyal bird that will return to your yard year after year (as long as they have a good experience there). The older birds return to their previous nesting grounds, and if you have your purple martin house open, you'll be thrilled to see them arrive and welcome them back. When you put your house up for the first time, make sure to number each entrance to the purple martin house. Most purple martin lovers keep a journal with observations about each nesting location and the birds that call it home. You can record the room number, number of eggs in the nest, how many eggs hatch and how each fledgling's growth progresses. Once you get started, you'll be surprised at how much you can learn about these beautiful little birds. There are two types of houses that purple martins commonly use as nesting boxes: gourds and multi-compartment bird houses. Gourds are individual homes that are usually placed close together to accommodate the purple martin's habit of nesting near other martins. Multi-compartment bird houses (aka condominiums) are the second type of bird house commonly put out as purple martin houses. These houses typically have a minimum of 6-8 individual nest boxes built into a larger unit. Often these homes can be stacked on top of each other to allow you to expand your neighborhood as the colony grows each year. Before you see your first purple martins (and during the winter), you will want to keep your purple martin house closed up. This keeps wasps, squirrels, and other birds from moving in before your purple martins have a chance to begin nesting. You can take the house down or just put something front of the entrance; paper cups or a small piece of plastic work well. What's wrong with this picture? 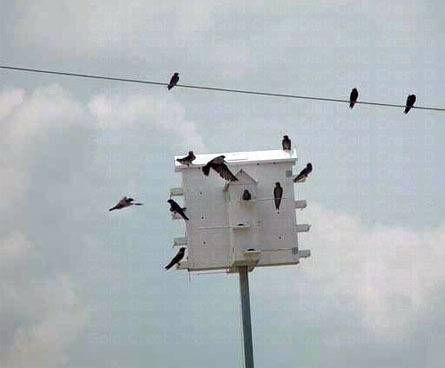 New purple martin landlords will want to make sure the house is placed in an ideal location for purple martins. A purple martin house should be mounted 10-20 feet off of the ground, and 40-120 feet away from houses or large trees. Martins love wide open spaces, so make sure you plan accordingly. A pole with a pulley system or easy up-and-down mechanism is a must-have. 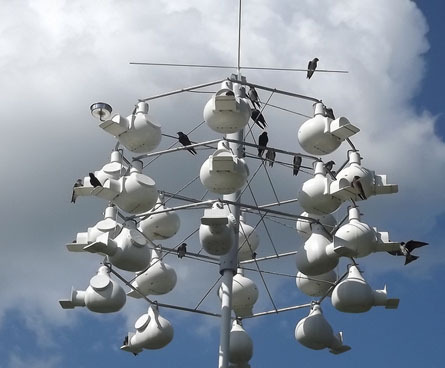 Purple martin houses are mounted away from other structures and high up. 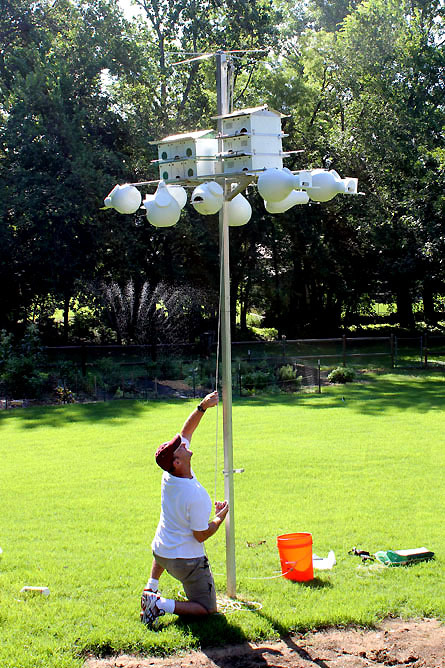 If you want to monitor your purple martin house, you'll quickly find yourself wanting more than a ladder. Trying to clean out a bird house while standing on a two-story ladder is a challenge that most home owners prefer not to tackle. Instead, invest in a house or pole with a system that makes the purple martin house easy to raise and lower. It's important that purple martins be the first birds to colonize your martin colony site each year. Purple martin houses are perfect for purple martins, but they are also the perfect size for other birds that are looking for nesting sites. European Starlings and House Sparrows are two of the biggest risks to nesting purple martins, and they do not migrate (so they are waiting for you to open up your purple martin home so they can move in). These non-native birds are often aggressive at pushing martins out of their homes (literally and figuratively). Mild-mannered purple martins often abandon their beautiful homes rather than deal with the harassment. Plan ahead. 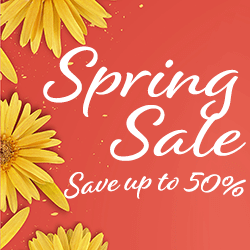 Buy purple martin homes that have starling-resistant entrance holes, or install startling-resistant doors over the openings. The larger starlings can't get into the purple martin house and will search for easier nesting sites. Actively manage trespassers. This can be a difficult task. New purple martin landlords underestimate the initial effort to keep competitors out of martin houses until the martins return and get settled in. You must repeatedly remove the nests of competing non-native birds from your purple martin house if you want purple martins to nest there. 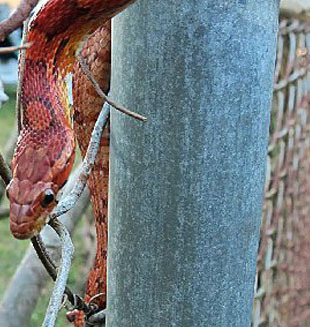 It's not just other birds that purple martins have to worry about. Raccoons, squirrels, snakes, owls and birds of prey are all predators that are in search of their nest meal. A house full of purple martin eggs and young birds is the perfect hunting ground. Pole guards (like squirrel baffles) should be put up to help keep your purple martin colony safe. If you are checking your purple martin houses regularly, you will know if your birds are nesting comfortably. If you find signs of a struggle or a destroyed nest in the purple martin house, you probably need to see if you can do anything to make the home a little safer. Each successful nesting season your birds have will bring more purple martins into your community. Many purple martin houses allow for eventual growth, and allow you to stack more martin homes on top of existing homes. These condominium-style houses let you start small and grow as your purple martin population grows. Enthusiastic and engaged purple martin landlords can look forward to many seasons of purple martin watching. Once the young birds leave the nest, they often stay nearby. It's amazing to see an entire flock of purple martins roosting together. It's an experience you have to see to believe.